Tajikistan with its capital Dushanbe is located in Asia (Central Asia, west of China). It covers some 144,101 square kilometers (slightly smaller than Wisconsin) with 8,468,560 citizens. Tajik and Russian are the languages commonly used by the people in Tajikistan. Afghanistan, China, Kyrgyzstan and Uzbekistan are bordering countries. Tajikistan is a landlocked country in Central Asia that borders Afghanistan to the south, China to the east, Kyrgyzstan to the north, and Uzbekistan to the west and northwest. Tajikistan is a stunning place, and there is plenty to do, from the Silk Road mystique of places like Khujand and Istaravshan, to the stunning, untouched mountain scenery of the Pamirs and their accompanying allure of unclimbed peaks and virgin trekking routes. To reach someone Tajikistan dial +992 prior to a number. The local cellular networks are operated on 900 MHz, 1800 MHz, 3G, 4G. Websites typically end with the top level domain ".tj". If you want to bring electric appliances (e.g. battery chaarger), keep in min the local 220 V - 50 Hz (plugs: C, F). The sign for the locally used currency Somoni is TJS. Three horizontal stripes of red (top), a wider stripe of white, and green; a gold crown surmounted by seven gold, five-pointed stars is located in the center of the white stripe; red represents the sun, victory, and the unity of the nation, white stands for purity, cotton, and mountain snows, while green is the color of Islam and the bounty of nature; the crown symbolizes the Tajik people; the seven stars signify the Tajik magic number "seven" - a symbol of perfection and the embodiment of happiness. The Tajik people came under Russian rule in the 1860s and 1870s, but Russia's hold on Central Asia weakened following the Revolution of 1917. Bands of indigenous guerrillas (called "basmachi") fiercely contested Bolshevik control of the area, which was not fully reestablished until 1925. Tajikistan was first created as an autonomous republic within Uzbekistan in 1924, but the USSR designated Tajikistan a separate republic in 1929 and transferred to it much of present-day Sughd province. Ethnic Uzbeks form a substantial minority in Tajikistan, and ethnic Tajiks an even larger minority in Uzbekistan. 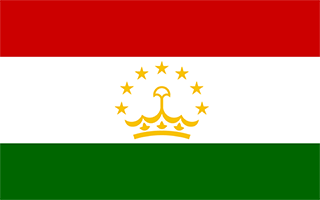 Tajikistan became independent in 1991 following the breakup of the Soviet Union, and experienced a civil war between regional factions from 1992 to 1997. Tajikistan has endured several domestic security incidents since 2010, including armed conflict between government forces and local strongmen in the Rasht Valley and between government forces and criminal groups in Gorno-Badakhshan Autonomous Oblast. In September 2015, government security forces rebuffed attacks by the Ministry of Interior led by a former high-ranking official in the Ministry of Defense. President Emomali RAHMON, who came to power during the civil war, used the attacks to ban the main opposition political party in Tajikistan. In May 2016, RAHMON further strengthened his position by having himself designated “Leader of the Nation” with limitless terms and lifelong immunity through constitutional amendments ratified in a referendum. The country remains the poorest in the former Soviet sphere. Tajikistan became a member of the World Trade Organization in March 2013. However, its economy continues to face major challenges, including dependence on remittances from Tajiks working in Russia, pervasive corruption, and the opiate trade in neighboring Afghanistan.